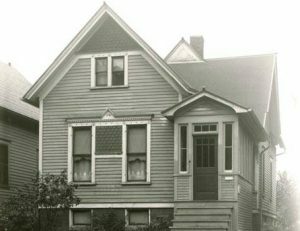 Known as a “raised cottage” in Chicago and other Midwestern cities, in Milwaukee the same house form became associated with Polish neighborhoods and was tagged with the name Polish Flat. “Raised cottage” offers an apt description of the process that produced these houses. 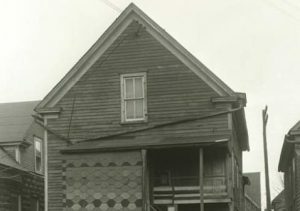 A 1911 Milwaukee housing study reported that in the late nineteenth century, many owners of simple four-roomed frame dwellings (workers’ cottages) wanted to improve their structures. They raised the cottages on posts to allow a semi-basement to be built underneath. Replacing the original timbers of the foundation with brick walls created an additional living unit below the original cottage. This incremental building process produced the majority of Milwaukee’s ten thousand units. 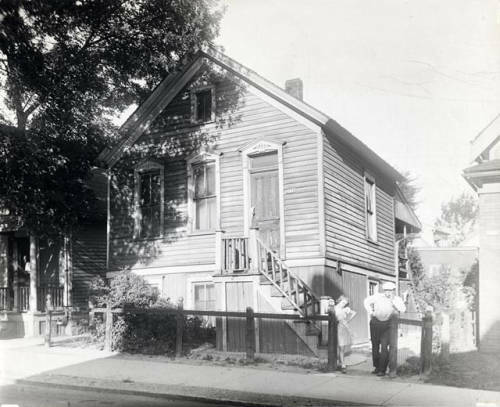 But as this affordable version of the duplex became more common, some built these structures as full two-story Polish flats rather than as adaptions of the single-story cottage. Between 1870 and 1920, a growing number of immigrants created a demand for affordable housing in Milwaukee’s poorer neighborhoods. The dominant incremental building process provided an inexpensive solution. With the housing supply strained, the Polish Flat house-type benefitted both the working-class landlords and their working-class tenants. An additional advantage of the raised cottage form was that once the homeowner achieved a degree of financial stability, the two-flat could be converted back to a single-family house. Given the common aspiration for homeownership in Milwaukee’s Polish ethnic community, many of its members bristled at the nickname attached to the house form by people outside their community. ^ Judith Kenny, “Polish Routes to Americanization: House Form and Landscape on Milwaukee’s Polish South Side,” in Wisconsin Land and Life , eds. Robert Clifford Ostergren and Thomas R. Vale (Madison, WI: University of Wisconsin Press, 1997), pp. 263-281. ^ Great Britain, Board of Trade, Cost of Living in American Towns (Washington, D.C.: Government Printing Office, 1911), 258. 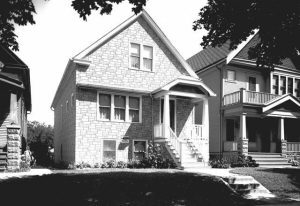 ^ Thomas C. Hubka and Judith T. Kenny, “The Transformation of the Workers’ Cottage in Milwaukee’s Polish Community,” People, Power, Places: Perspectives in Vernacular Architecture VIII (2000): 33-52. ^ Hubka and Kenny, “The Transformation of the Workers’ Cottage in Milwaukee’s Polish Community,” 39-42. ^ Hubka and Kenny, “The Transformation of the Workers’ Cottage in Milwaukee’s Polish Community,” 41. Hubka, Thomas C., and Judith T. Kenny. “The Transformation of the Workers’ Cottage in Milwaukee’s Polish Community.” People, Power, Places: Perspectives in Vernacular Architecture VIII (2000): 33-52. Kenny, Judith. “Polish Routes to Americanization: House Form and Landscape on Milwaukee’s Polish South Side.” In Wisconsin Land and Life, edited by Robert Clifford Ostergren and Thomas R. Vale, 263-281. Madison, WI: University of Wisconsin Press, 1997.